Which plant species grow where, alongside which others—and why? The diversity of global vegetation can be described based on only a few traits from each species. This has been revealed by a research team led by Martin Luther University Halle-Wittenberg (MLU) and the German Centre for Integrative Biodiversity Research (iDiv) Halle-Jena-Leipzig. 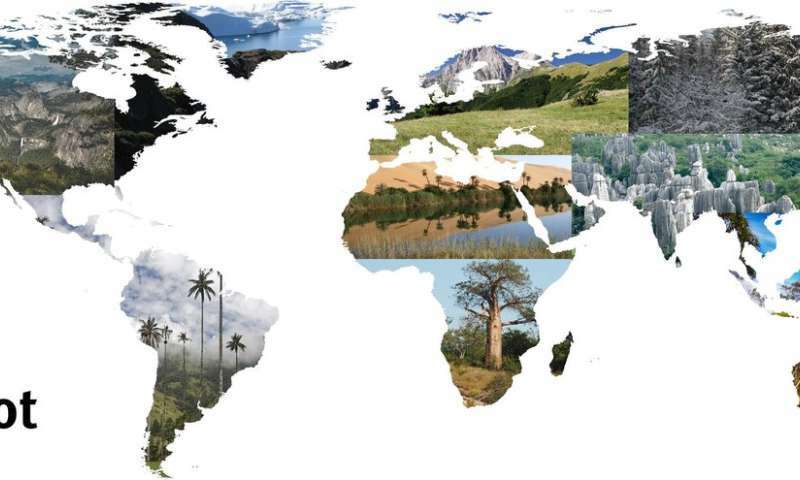 In a new study published in the scientific journal Nature Ecology & Evolution, they present the world's first global vegetation database which contains over 1.1 million complete lists of plant species sampled across all Earth's ecosystems. The database could help better predict the consequences of global climate change. Currently, around 390,000 plant species are known to science. Over time, each species has developed very different traits in reaction to external factors at their location. These include the plant's size, the thickness and the chemical constituents of its leaves. These properties are also referred to as functional plant traits. "These functional traits directly influence a plant's ecosystem function, such as how much biomass it produces or how much carbon dioxide it absorbs from the air," says Bruelheide. The research group combined this massive dataset with the world's largest database for plant traits called "TRY" which is also an iDiv database platform. "It has enabled us to answer questions that nobody has been able to tackle before," Bruelheide continues. The research tested, for instance, to what extent global factors influence the functional traits of plant communities. Contrary to current opinion, they found that temperature and precipitation play a relatively limited role. "Surprisingly, these two macro-factors are not so important. Our analysis shows, for example, that plant communities are not consistently characterised by thinner leaves as the temperature increases—from the Arctic to the tropical rainforest," says Bruelheide. Instead the researchers found a close tie between climate variables and the phosphorus supply in the leaves, reflected in the ratio between nitrogen and phosphorus content in the leaf, which is an indicator of plants' nutritional status. For example, the longer the vegetation period, the lower the phosphorus supply—which also affects leaf thickness. Local land use and the interaction of different plants at a specific location have a much greater impact on the functional traits of plant communities. According to Bruelheide, these findings show that future calculations of plant production in a region cannot only be determined on the basis of simplistic temperature-precipitation models. The study published in Nature Ecology & Evolution is the first of a series of upcoming papers by the "sPlot" consortium. Being available on request to other scientists, the "sPlot" database is disclosing unprecedented opportunities to tackle numerous biodiversity questions at the global scale, including the issues pertaining to the distribution of non-native plant species and the similarities and differences of plant communities across world regions.